Remember that scene in Juno, when she makes her way to the convenience store for her third pregnancy test and is told by the cashier that there’s no use denying it, her ‘eggo is preggo’? And ever had to make that trip to the supermarket, throwing a load of other stuff in the basket so that you end up with the most erratic compilation of items – chocolate digestives, grapes, pregnancy test, rice cakes – as if the cashier might not notice it among the other things in there, and you can avoid their knowing eyebrow-raise? Imagine how convenient it would be if you could simply rock up to a vending machine, pop in a few quid, and get yourself a pregnancy test or the morning-after pill in seconds. No human interaction required and no Closing Hours harbouring your progress – you could even buy some snacks for the journey back to the bathroom too. Well, that’s just what one laundrette in Brooklyn is offering. Alongside its laundry machines, arcade games and bar (yes, you read that right), the Sunshine Laundromat in Greenpoint has a vending machine stocked with Plan B pills, lube and an assortment of pregnancy tests. AND Snickers bars. It’s pretty much the only machine any woman will ever need. According to neighbourhood news site DNAinfo, Sunshine Laundromat’s owner Peter Rose started stocking the items as a joke, adding: ‘It’s not to make a political statement’. But he could be on to a good idea. One woman interviewed for the site recalled a friend’s daughter buying a pregnancy test at the Laundromat because she didn’t want anyone to know about it, and there’s no provision in the Federal Food, Drug and Cosmetic Act that prohibits the sale of over-the-counter drug preparations in vending machines. There’s no doubt such machines would be a handy addition to laundry rooms at university halls of residence across the UK, and we’re onboard with anything that removes the stigma from women’s reproductive health. And considering you can get floral arrangements from vending machines in Japan, they’re hardly the craziest things to have ever been vended. 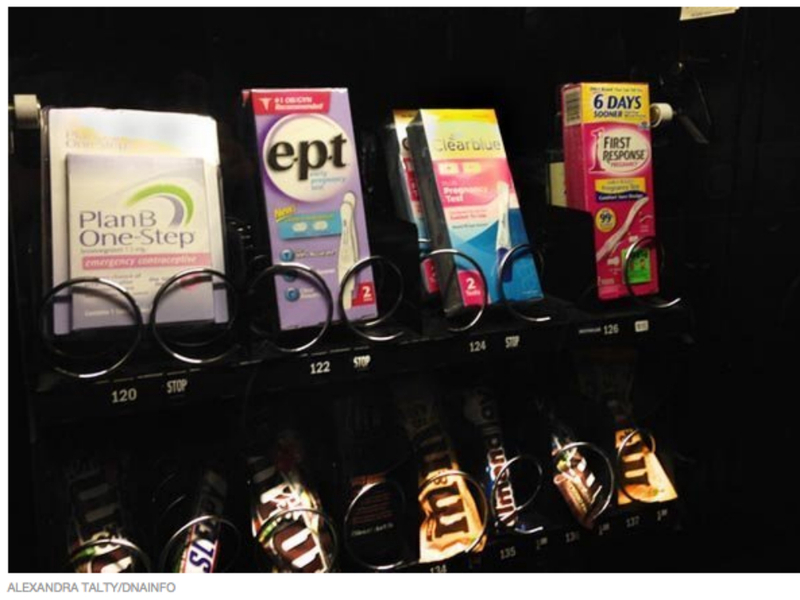 Taking care of your reproductive health and snack craving with one machine? Now that’s convenient.